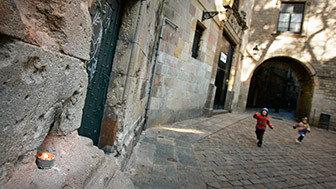 The district of Gràcia opens up its streets and squares to multiculturalism and the most cosmopolitan of artists, to music, theatre and cinema, but without losing its essence as a proud village that is different and wants to reassert its past. A Gràcia with grace. 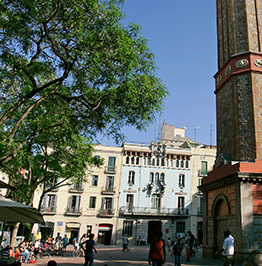 Gràcia is a charismatic, bustling, cosmopolitan and bohemian district. A place where lifelong residents and exchange students, Gypsies who play music on the streets and bohemian artists looking for inspiration, all live side by side; the young and not so young who greet each other in the squares, while queuing at the independent cinema. It is one big family in Gràcia, a district with room for everyone. Their independent character comes from a long way back, when the land that forms the present district was part of the old village (vila) of Gràcia, founded as a parish in 1628 and independent from 1856 to 1897. 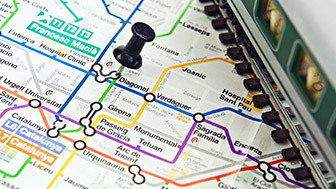 The upper part of the district, with the Vallcarca, El Coll and La Salut neighbourhoods, which descends to Vila de Gràcia, Camp d’en Grassot and Gràcia Nova, was basically rural originally. Some old farmhouses (masies) have survived that can be seen dotted around La Salut and round Park Güell. One old ancestral home (casa pairal) that stands out is Can Tusquets, a noble masia with a neoclassical influence that is surrounded by gardens and today houses the convent of the Sant Josep de la Muntanya sisters. Another is Can Xipret, the current Club Tennis de la Salut, a sober masia where the building and facade have been preserved. Culture and creativity are to be found everywhere. Big shops, little boutiques, studios and cultural centres are dotted along streets with flowery and poetic names that open out into dozens of squares in the old town. Life goes on around them, like small stages of domestic theatre. The grace and charm of Gràcia is everywhere. 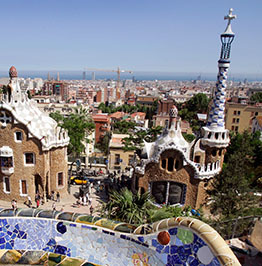 It extends to the upper part of the district, where a never-ending stream of visitors go up to and come back down from Park Güell, the landscaped residential garden city dreamt up by the industrialist Eusebi Güell and made reality by the genius of Antoni Gaudí. It extends to the Gràcia neighbourhood, full of art, culture and life, and inspired businesses offering creations from today and yesterday. To its must-visit festival, where creativity takes over the streets and squares, turning them into floors for dancing to the sounds of the charanga bands. To Plaça del Raspall in Vila de Gràcia, the birthplace of Catalan rumba where proud Gypsies play ventilador (fan) rhythms so your feet almost move by themselves. And to the terraces, with a lot to choose from, that are always open for you to have a cool drink and enjoy the atmosphere. 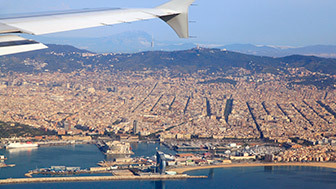 In fact, legend has it that once you go there and it steals your heart, it is difficult to leave Gràcia. With a young spirit and always full of life, the Gràcia neighbourhood has a long history behind it which stretches back centuries to when it was a village, separate from Barcelona. Park Güell, the hill that Gaudí turned into a truly fantastic and original garden, is one of Barcelona's best-known and most spectacular icons. 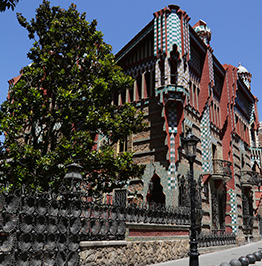 The top part of Vila de Gràcia holds a valuable secret: Casa Vicens, one of the first works designed by Antoni Gaudí. Today, the old stone quarry in the Coll neighbourhood is one of the most refreshing parks in the city. 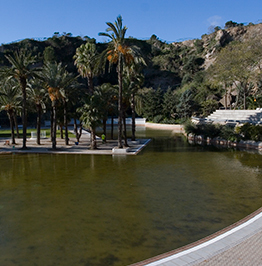 It has a pool and an impressive sculpture by Eduardo Chillida. 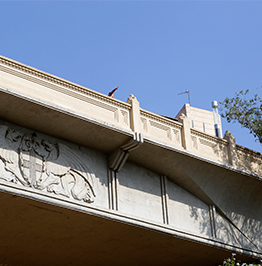 Between the Coll and Putxet hills, Vallcarca Viaduct spans the heights above what used to be a gulley, offering an impressive view of the city. 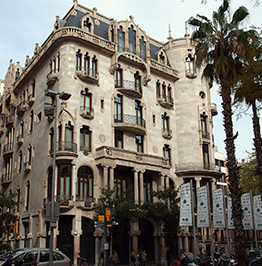 The last work of the great Modernista architect Domènech i Montaner in Barcelona is Casa Fuster, which straddles the Eixample and Gràcia.